They say there’s no such thing as too much of a good thing and they’ve never been more right! 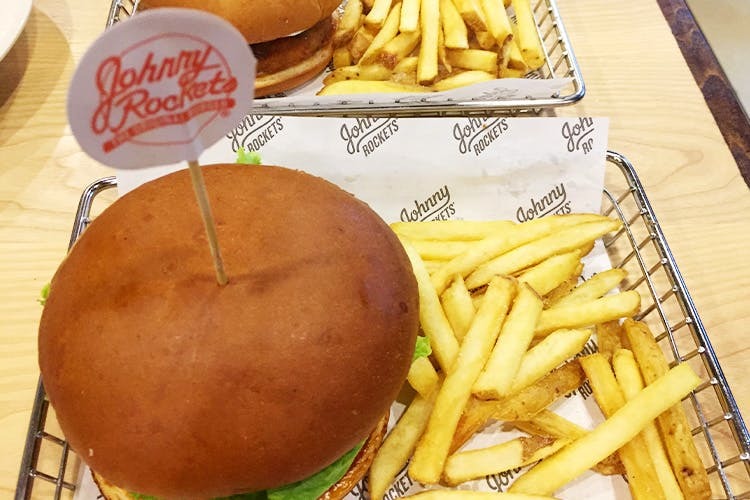 G Town is happy to welcome its second Johnny Rockets and it’s as funky, delicious and chill as the first one. Think laid-back, loaded burgers, decadent milkshakes and the best onion rings ever! The original Johnny Rockets has temporarily shut shop at Ambiance Mall and is due to be back bigger and better real soon but in the meantime, they have an all new one at Grand Mall. It has all the trappings of a true blue all-American diner. Think thick shakes and perfectly fried onion rings, stellar burgers and cutesy little desserts. The best part of the new 2.0 diner experience? You can customise your burger. You heard it! Choose the bread, choose a patty and there you have a burger made to order! Though the original is definitely the best with lettuce, tomato, onion, relish, pickles, mustard and mayonnaise, we loved the Houston even more. The Houston comes with jalapenos, pepper jack cheese and chipotle ranch sauce. It works best with the lamb and tenderloin options. For veggie and chicken try the Smoke House which comes with cheddar cheese and a smoky house BBQ sauce. Whether you’re out on a date or out with the family, Johnny Rockets is the perfect venue for a hearty meal over long conversations. Order loads of Bacon Fries, Rocket Wings and Loaded Nachos with a side of the best ever coffee or strawberry banana milk shake, thick and delicious and you’re sorted! Ditch soggy burgers and old fries and choose a wholesome diner experience at a whole new venue, where Johnny Rockets is bigger and better!